The state is desperately trying to find more teachers for students who speak and understand limited English. So a story told at a recent Education Committee hearing was particularly troubling. A teacher who had taught in Puerto Rico for 20 years said he couldn’t teach bilingual education in Connecticut because of the state’s stricter certification requirements. “This is really not the sort of story we want to hear,” said Rep. Andy Fleischmann, House chairman of the Education Committee, and one of the top state legislators seeking to overhaul education for English learners. With one out of every 15 students in Connecticut’s public schools speaking and understanding limited English, their achievement lags far behind that of their classmates. The gap in Connecticut is among the largest in the nation, according to the U.S. Department of Education. And the state’s strategy to catch these students up largely depends on a dwindling qualified workforce of teachers, while the number of students is steadily increasing across the state. “The gaps in our understanding of these issues and how to deal with them was all so glaring,” House Speaker J. Brendan Sharkey, D-Hamden, said recently after receiving a report from a panel he appointed to review the system. Parents and advocates in some Connecticut school districts have noticed. Facing federal investigations into the education being provided to English learners, Hartford and Stamford school officials over the last two years promised major changes. There is also an open investigation into New Britain Public Schools. A ‘gold standard’ or ‘language ghetto’? Enuri Padilla couldn’t understand a word her teachers were saying when she moved to West Hartford from Peru five years ago. Placed in classes taught in English with other students who spoke limited English, she struggled to learn the language. My classmates were my translators, says Enuri Padilla. Concern about the quality of these courses for English learners is mounting. “Some of those classes have become a dumping ground,” said state Sen. Toni Boucher, the senate Republican minority leader of the Education Committee who was an English learner herself years ago when she moved to the U.S. from Italy. Boucher said students have told her of experiences where they felt nothing was expected of them. “Some call it a language ghetto,” said Elena Koulidobrova, a linguistics professor at Central Connecticut State University and member of the House speakers’ panel that reviewed the system. State law requires that children who struggle with English be offered some instruction in their native language if their school has more than 20 students who speak the same non-English language. Students attending schools that are not required to provide instruction in their native language — 13,578 students this year — are still entitled to services to address their needs. Many schools try to accomplish this by offering separate classes for English learners that are taught in English, as was the case for Padilla. Many educators, researchers and legislators believe that providing quality bilingual instruction is the best bet. “That is the gold standard,” said Rep. Gail Lavielle, the house Republican minority leader of the Education Committee. “There is an overwhelming amount of research that shows if you can do a dual-language, bilingual program, you are much better off,” said Koulidobrova. But some disagree bilingual instruction is the best approach. Voters in California and Massachusetts years ago voted to eliminate bilingual instruction as the primary teaching method and instead required students be provided English-only courses. In Windham — which has the highest concentration of English learners among Connecticut’s school districts — the state-appointed “Special Master” decided to stop offering students bilingual courses two years ago. The speakers’ task force is backing bilingual instruction, and proposes expanding its availability. The panel also recommends allowing districts or the State Department of Education to extend how long students can stay in bilingual programs from three to five school years. The extension would happen after standards are adopted for these programs. One-third of students in Connecticut do not reach English proficiency by the current three-year deadline, the panel reports. “Students learn at different paces,” said Rep. Juan Candelaria, the co-chairman of the panel who only spoke Spanish when he moved to the U.S. at age 8. He also points to research that shows that it can take between five and nine years for a student to reach grade-level proficiency. But the reputation of the present programs for English learners may be diminishing student participation. This school year, the parents of 5,981 students struggling with English asked that their children not participate in various programs for English learners, reports the State Department of Education. It’s unclear why so many parents are declining these services. The state’s education department has not surveyed parents on their experiences. Milly Arciniegas, a Hartford parent who, as the leader of Hartford Parent University, works to educate parents about their rights, said some programs have a bad reputation, or parents are being steered away from participating. Connecticut school districts don’t have enough qualified teachers for students who understand limited English. Colleges in Connecticut only graduate about 42 people each year to help fill nearly 800 vacant positions, according to the state Office of Higher Education. 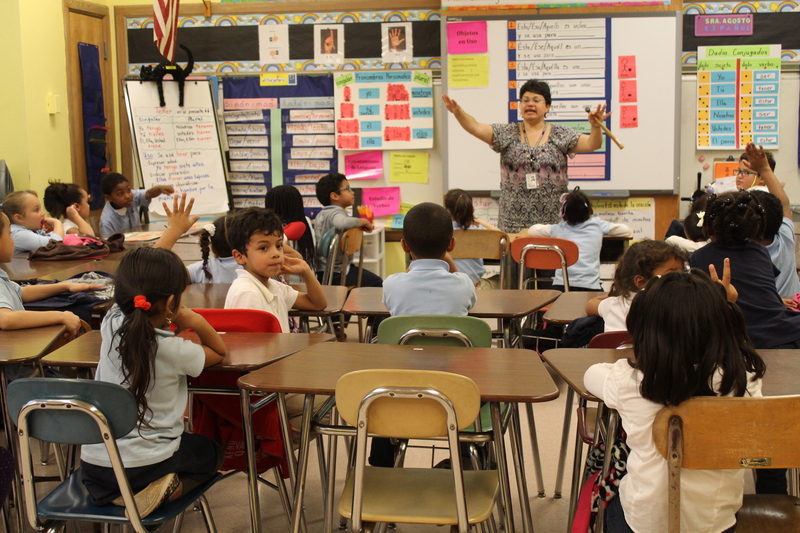 Couple that with what the Connecticut State Department of Education reports is “significant personnel turnover” and the fact that nearly half of existing bilingual teachers are approaching retirement age, and districts are left scrambling to fill vacancies. “Our problem is people were choosing bilingual classes, and we didn’t have the room,” said Mike Meyer, who oversees English learner programs for Stamford Public Schools. Because of this dilemma and a settlement the district reached with the U.S. Department of Justice, Stamford overhauled its programs for English learners, who make up 12 percent of its students. But the district still isn’t able to find all the staff it needs to teach these students. Stamford currently has 24 teaching vacancies for English learners. Officials at the state education department are well aware of the shortfall. “We know that many of our districts want very much to be able to offer bilingual education,” said Dianna R. Wentzell, who served as the education department’s chief academic officer before becoming the interim education commissioner. When districts are unable to find a qualified teacher for these students, school officials are left hiring someone working to gain the appropriate credentials, a substitute or reshuffling their programs. Connecticut does not require that general classroom teachers receive training on best practices for educating English learners, though some teachers do get such training. Finding teachers is a problem districts across the nation face. English language learners “are disproportionately taught by less-qualified teachers and many mainstream educators lack training in ELL teaching methods,” reports the Education Commission of the States, a nonpartisan think tank that tracks education policy. The speakers’ panel worries this shortfall is negatively impacting students. Among the state’s English learners, 37 percent made progress from their prior assessment and 43 percent attained proficiency during the 2012-13 school year, the education department reported. The state has also struggled to close the long-standing gaps in achievement between English learners and their peers. There are two types of certificates available in Connecticut to teach non-English-speaking students: bilingual and Teachers of English to Speakers of Other Languages (TESOL). The main difference between the two is that bilingual teachers speak the language of the students they are teaching. TESOL teachers do not, so they use pictures, body language and other resources to help their students. State law requires middle and high school teachers to not only receive an endorsement in helping students learn in English but also to get certified in a subject area. Elementary teachers also need both endorsements. House Speaker J. Brendan Sharkey flanked by members of his task force that studied how to improve the education of students who understand limited English. The speakers’ task force is backing legislation that could create some flexibility in these requirements. The legislation would require the state education department to enter into interstate agreements so that teachers of English learners in other states could more easily teach in Connecticut. It would also require the Office of Higher Education to reopen its alternate route program for people to become bilingual or TESOL teachers. But the education department does not support the changes. Instead, the department has proposed legislation that would give teachers working toward earning the additional certification requirements more time to complete their work while still being able to teach. If cost is a barrier, some federal student loans are forgivable for these teachers. In Stamford, the district also provides some help for current teachers to fulfill the additional requirements, Meyer said. The state education department and the speakers’ task force also hope to increase funding to help cover tuition or pay off student loans for future bilingual and TESOL teachers. State lawmakers in 2014 created a scholarship for these future teachers, but only four people have received them to date for a combined total of $12,500. Facing a deficit, the governor’s proposed budget eliminates funding for this scholarship next year and for the alternate route to certification program. But Sharkey, the House speaker, said he wants the state budget to direct an additional $5 million toward programs for English learners. “The single most important finding is that the system is woefully underfunded and understaffed. 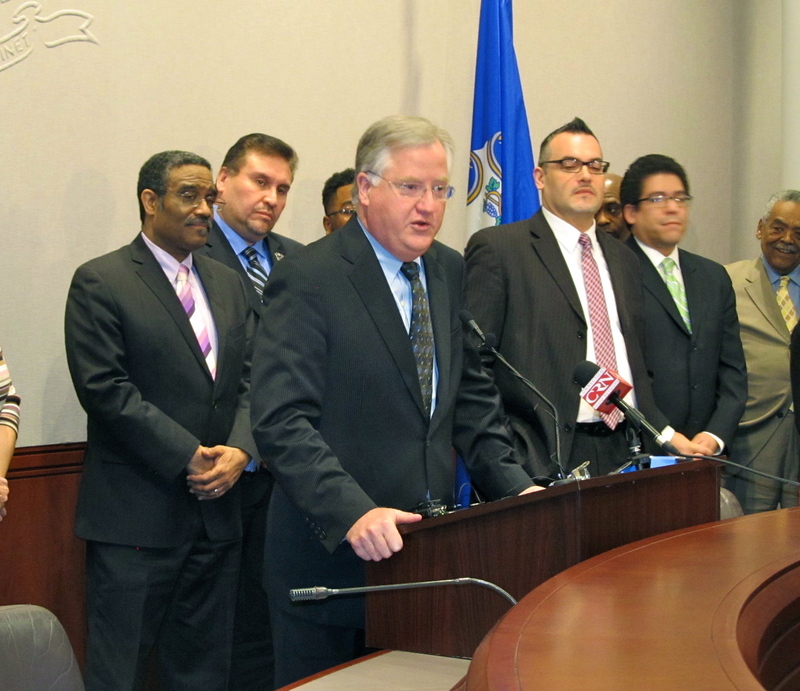 If we do not directly address this issue, Connecticut will never close the nation’s most significant achievement gap,” the speaker’s panel wrote in its 20-page report. The federal government is expected to provide Connecticut with $6.3 million this year to help cover programs for English learners. The state’s main education funding grant, which provides municipalities about $2 billion each year, stopped factoring in how many English learners were enrolled in a district in 2013. Funding had been directed, in part, to districts with higher concentrations of these high-need students. The state does have a $1.9 million grant dedicated to helping municipalities cover their bilingual costs. The state education department is requesting that it be allowed to repurpose some of that money because every year some funding is leftover since not enough towns apply for the grant. Wentzell said the department wants the remaining balance to go to help teachers with costs associated with becoming a qualified teacher for these students. But some legislators worry increasing how long people have to become certified and helping out with the costs will not land enough teachers. Others worry that providing flexibility to the teaching standards could harm the quality of instruction. In the meantime, teachers from other states are left working to fulfill all the additional requirements Connecticut has for its bilingual teachers. Correction: An earlier version of this story misidentified the teacher who spoke at the recent Education Committee public hearing on improving Connecticut’s programs for educating English language learners.